Read Write Inc. Literacy and Language, publishing in May 2013, is a new programme* that will cover your literacy and language teaching from years 2-6/P3-7. The programme inspires a love of literature through the study of complete texts, with a core structure of grammar skills taught in context and through writing, to ensure children become confident writers with real skills at their command. Each unit offers a multi-layered approach to developing comprehension, vocabulary, writing, critical thinking, spoken language and explicit guidance for teaching grammar skills. The resources for each year are a Teacher's Handbook, a CD-ROM, an Anthology, a Pupils' Book and a Homework Book. Work centres around the texts in the Anthologies, which contain complete stories, poems, play scripts and non-fiction texts written by leading authors including: Michael Morpurgo, Jeremy Strong, Ted Hughes, Jamila Gavin, Geraldine McCaughrean, and Roger McGough Children are introduced to a text through a three layered approach: Story Version 1, 2 and 3. Each version of the story contains more information about the setting, characters and plot. This approach provides children with opportunities to develop an implicit knowledge and deep understanding of the structures of language and of the stories in the Anthologies. A range of reading, writing, speaking and listening and drama activities develop understanding further. Children then see a new text being composed through modelled writing by the teacher, through the planning, oral rehearsing, drafting and editing stages. Supported by the teacher, the children then mirror the process the teacher has modelled, drafting and revising so that they write ambitiously and accurately as they compose their own extended piece of writing. So Literacy and Language ensures that, as the new National Curriculum advises, children learn, through being shown, the skills and processes essential for writing. Grammar concepts are taught in context and through writing so they are meaningful for children. The Software also contains a Grammar Bank - a reference tool for teachers to help them teach grammar with confidence. It covers all the grammar concepts in the National Curriculum from Years 2-6 and includes 'Test yourself' sections, with answers, to help teachers check their understanding. There are also practice tests to prepare children for the Year 6 English Grammar, Punctuation and Spelling Test. A 'Big Question' links the fiction and non-fiction elements, encouraging children to reason, debate and think critically about the texts they read and develop their spoken language skills. The programme will be matched to the new curriculum and the Teacher's Handbooks show clearly how activities link to the programmes of study. 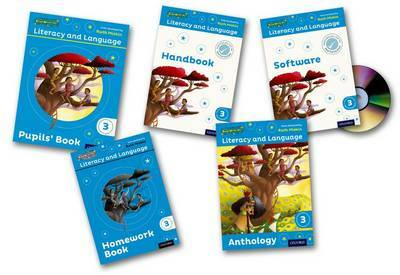 *Year 5 and 6 are new editions of a programme previously called Comprehension Plus.